On Jan 12, 2010, the massive 7.0 magnitude earthquake hit Haiti and severely damaged the airport facilities in Port-au-Prince. The airport was temporarily shut down immediately following the earthquake, but reopened for the military, humanitarian and private flights only. Since the ground-based Navigation Aids were damaged or destroyed, the airport’s capacity to handle flights was greatly reduced and was limited only to RNAV Support aircraft that did not require air traffic control assistance. 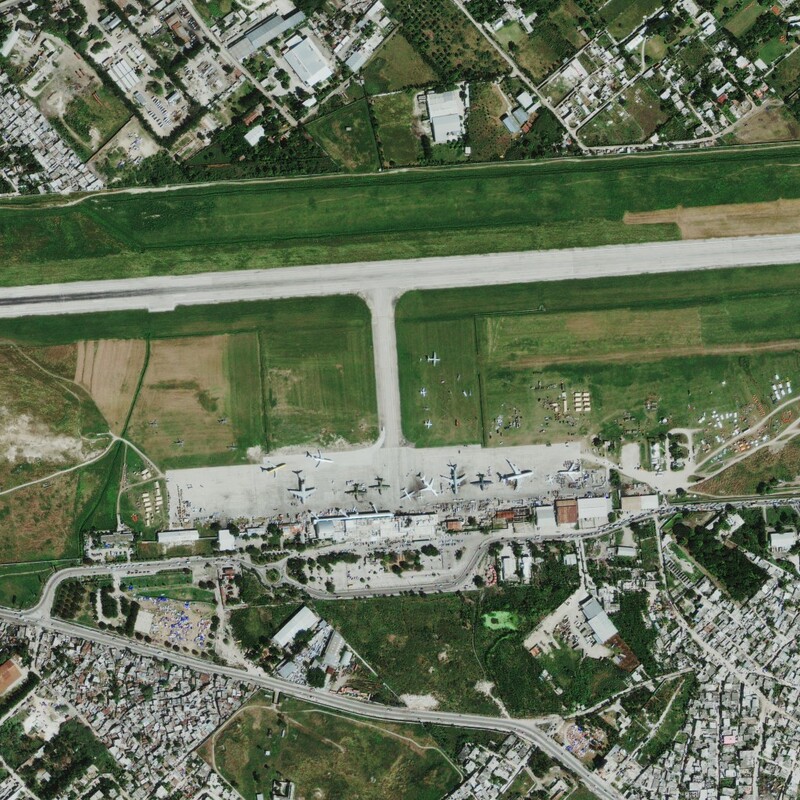 The Port-au-Prince airport runways were operational but normal control tower activities had limited authorization capability for incoming flights – which made the logistics of bringing rescue and relief teams and supplies extremely challenging. Since all of the ground navigation aids were destroyed or compromised at the Haiti airport, conventional instrument approach procedures were unusable. This made it necessary for aircrews to fly into the Port-au-Prince (MTPP) and Santo Domingo (MDSD) airports using Area Navigation (RNAV) GPS Instrument approach procedures. AeroNavData was included on an inquiry from the Department of the Navy asking who in the DoD Aeronautical Community might have GPS procedures for Haiti operations, as they currently only had conventional VOR and NDB procedures for the airport, and no RNAV GPS procedures. Since AeroNavData had the needed AIP and knew we could assist, we immediately contacted Air Force Flight Standards organization to volunteer to code the procedure and deliver them to the National Geospatial-Intelligence Agency (NGA), for all branches of the military and first responder teams to have access to the needed procedures and begin flying their relief efforts. The PORT-AU-PRINCE RNAV (GPS) Runway (RWY) 28 Procedures entered AeroNavData’s DO-200 Digital Coding Process and the supporting data was checked and verified for accuracy. The supporting data was stringently monitored for changes during the Rapid Response Process and the AeroNavData team performed rigorous procedure checks and created 8260-10 Documents of the ARINC Coding and documents for SID/ STAR and IAPs. Any need for modification of source data was immediately reported to originating terminal procedures (TERPs) office. We increased DAFIF terminal holdings for Database exchange and performed quality check DAFIF® terminals. Since we had access to the entire source data needed for these procedures in our FAA Source Library, we realized that we could quickly and accurately assist with coding RNAV procedures that the flight management systems could readily ingest. Within 24 hours we were able to code the procedures and send them to the NGA, which created & posted their first ever “out-of-cycle” DAFIF release, enabling all aircrews from all military branches to load the procedures and fly to Haiti swiftly and safely. With our rapid response and overnight procedure coding, the NGA was able to insert and execute a crisis support model modifying the normal 28-day data production cycle (normally a 2-week workflow) to 72 hours. It was an honor to assist the Air Force active duty and Reserve Airmen in verifying the procedures they needed to land the C17 safely at the Haiti airport. We are grateful to our Air Force and first responder teams for their service to this humanitarian effort. On Jan 12, 2010 the massive 7.0 magnitude earthquake hit Haiti and severely damaged the airport facilities in Port-au-Prince. Since the ground-based Navigation Aids were damaged or destroyed, the airport’s capacity to handle flights was greatly reduced and was limited only to RNAV Support aircraft that did not require air traffic control assistance.